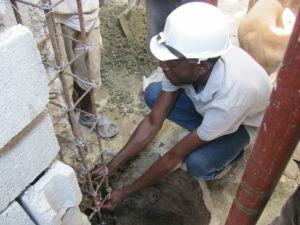 Skat Consulting was commissioned to evaluate the retrofit project of CARE in Carrefour, Haiti. The purpose of the RTE was to gain an insight into lesson learnt as well as to consider different options in order to make an informed decision on whether and how the pilot phase can be scaled up into Phase II of the Retrofit Project. Retrofit means the reinforcement or upgrading of existing houses to become more resistant and resilient to the damaging effects of hazards (earthquakes). The RTE reflected on the technical feasibility, acceptance of the project by the community, and the ability of the project team to reduce and mitigate risks. Skat started with a review of documents, using questionnaires that Skat developed in accordance with the guiding questions – listed in the TORs. The questionnaires served as a backbone for the semi-structured interviews, observation during site visits, and the documents review. Further, the evaluator of Skat travelled to Haiti and carried out semi-structured face-to-face interviews with key informants, also using a questionnaire as a backbone during the meetings. Skat made use of a mix of various methods (key informant interviews, review of documents, and observational research) as well as triangulation (use of different sources of information and tools to analyse findings). At the end, Skat provided recommendations and a proposal for the next steps; identified potential risks and how to mitigate them; developed a suitable approach for the implementation of phase II; and drafted ways of how to multiply and institutionalise the retrofit model in the future in Haiti. This was all done in close consultation with CARE’s Shelter Coordinator and the Project Manager of Retrofit.